Hello Blogging Friends!! I know it's a hot summer day but I have a card that will maybe help cool things off a bit. LOL! 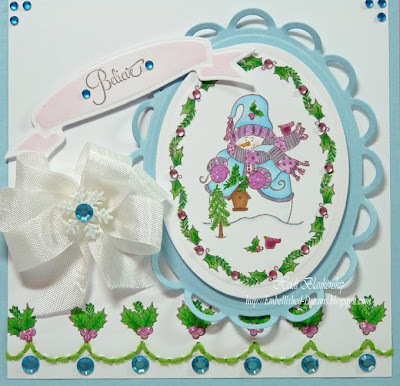 I created this cute snowman card using JB-09945 Blizzard Bunch stamp set from JustRite Stampers and non-traditional Christmas colors. 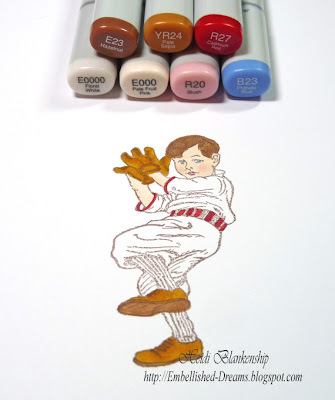 I used Copic markers for all of the coloring. I used a handy little tool from We R Memory Keeper called Sew Easy to create the hand stitched trim. 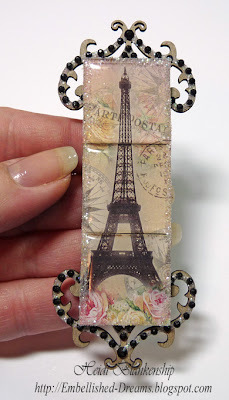 The little while pierces the paper creating a pattern and then you just hand stitch it! I added some rhinestones, glitter and a seam binding bow with a snowflake button. Thanks so much for stopping by today!! I hope you are staying cool and having a great summer day! Hello! 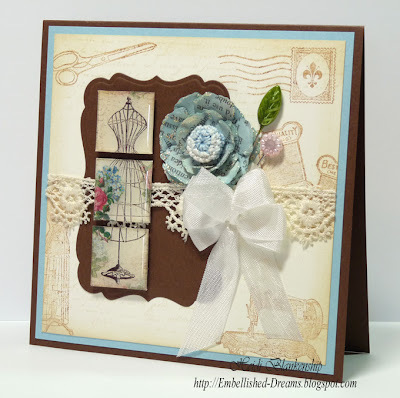 Today, I have a fun summer layout to share with you. I LOVE watermelon and it is always a favorite at any family gathering in the summer. Last weekend our family got together to celebrate my grandpa's 81st birthday! My grandpa loves watermelon too so we had birthday cake and fresh cut watermelon. The kids were really enjoying the watermelon--lol! I was snapping a few pictures and got this cute one of my cousin's little girl, Lilly. I just had to create a layout! 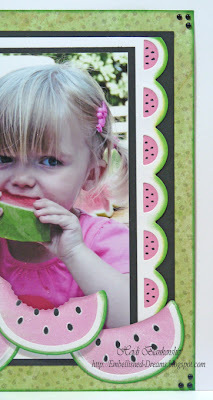 ;-) To make the watermelon die cuts I used S4-276 Sweet Treats die templates from Spellbinders™. I started out with white paper and did the Reverse Stencil technique with pink and green ink to add the color to the paper. 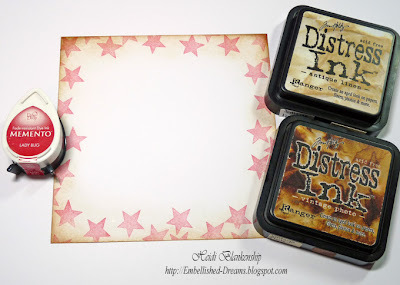 To do Reverse Stenciling ink the inside of the die template and then cut/emboss as usual. Then I left the paper in the die template and used black ink to stencil the watermelon seeds. 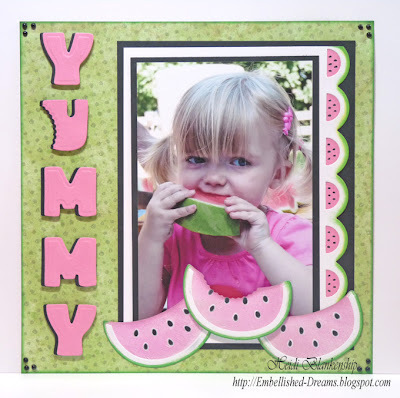 To create the bite in the watermelon I used S4-115 Petite Scalloped Circles Large. I also popped up the middle slice using 3D Foam Squares from Scrapbook Adhesives by 3L™. To create the watermelon border I used the New E8-001 Classic Scallop Edgeabilities. 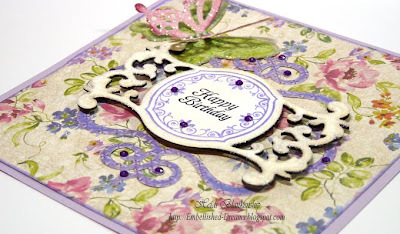 I started with white paper, inked the scallops with green ink and cut another strip using just the scallop die template. Then I used a black marker to add the seeds. 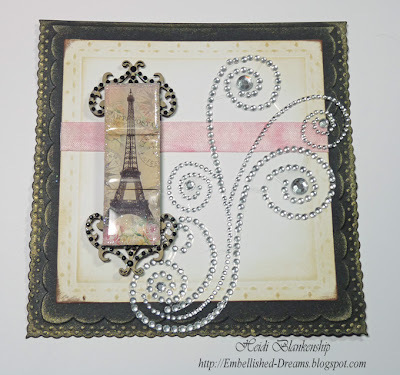 I also added some 72 Count Black Pearls from Want2Scrap™ in the corners. For the title I used LF-003 Donna's Alphas from Spellbinders™. 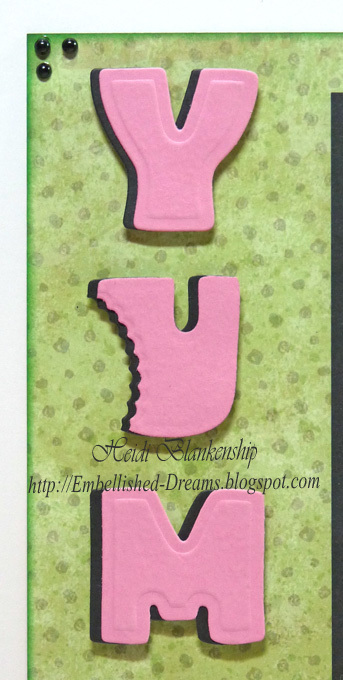 I used pink and black paper and offset the paper to create a shadow effect. I also took a little bite out of the U using S4-115 Petite Scalloped Circles Large and then I popped up the letters with 3D Foam Squares. Thanks so much for stopping by today! I hope you have a Fantastic weekend!! Hello blogging friends! 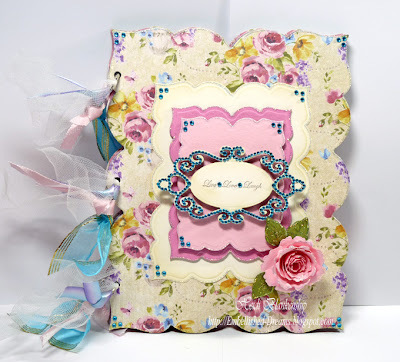 Today, I have one of the New Grand Chipboard Albums to share with you from Want2Scrap™. 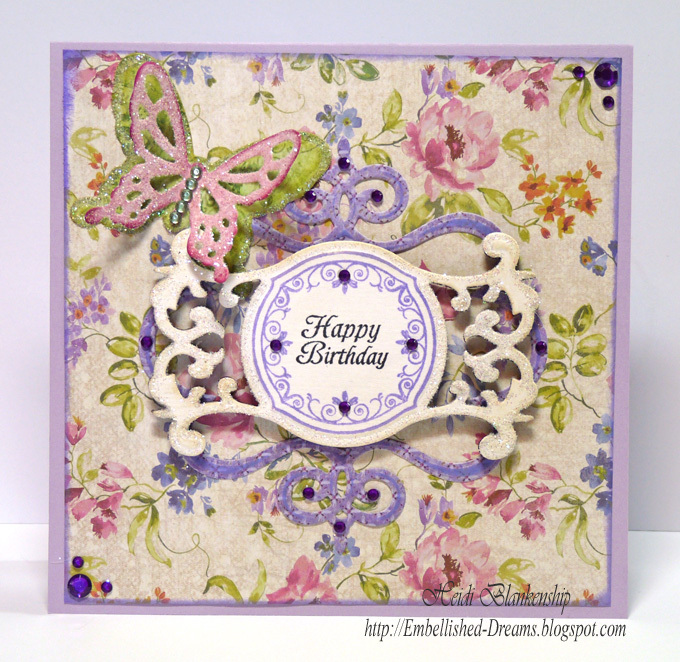 This album is Grand Chipboard Album - Labels Twenty-Three and it coordinates with Spellbinders™ LF-347 Grand Labels Twenty-Three die template #6 measuring 8⅜ x 6⅝". So you can die cut your favorite papers for a perfect match to the album! I covered all of the pages with K & Company Watercolor Collection. I love all of the papers in this collection!! On the front cover I used LF-347 Grand Labels Twenty-Three #2, S4-347 Labels Twenty-Three #5, #6 die templates from Spellbinders™ and perfectly matched them with Nestaboard™ Labels Twenty-Three from Want2Scrap™. 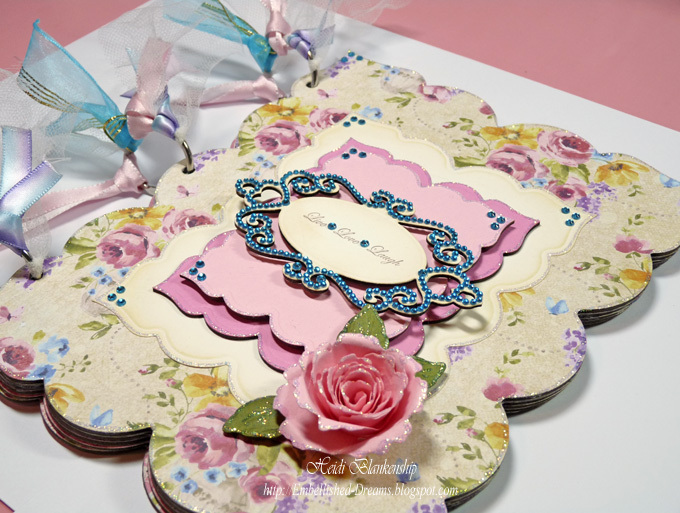 I also used S4-351 Spiral Blossom One, S5-030 Fancy Tags Two, S4-328 Foliage die templates from Spellbinders™ and Nestaboard™ Fancy Tags Two and Nestabling™ Fancy Tags Two Turquoise Rhinestones from Want2Scrap™. 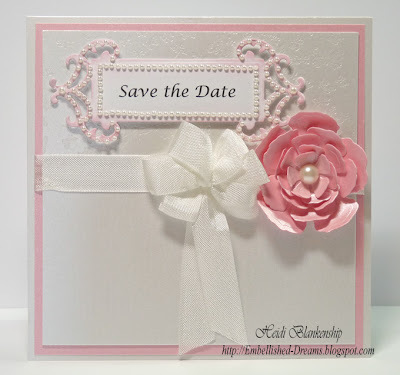 For the sentiment I used CL-02130 Faith stamp set from JustRite Stampers. All of the solid colored paper is from Discount Cardstock. Here is a close up of the rose. 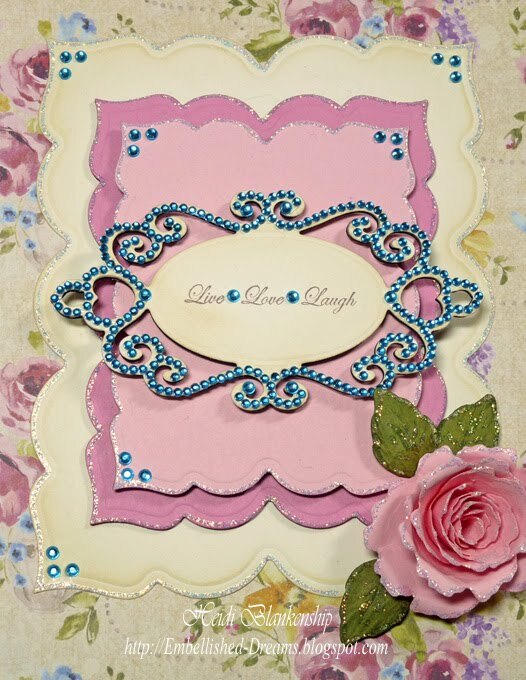 You can also see from the photo that I added Diamond Stickles to the rose, leaves and around the edge of the front cover and Baby Bling Rhinestones Turquoise in the corners. I love the look of the Nestaboard™ and how much dimension it adds to a project! 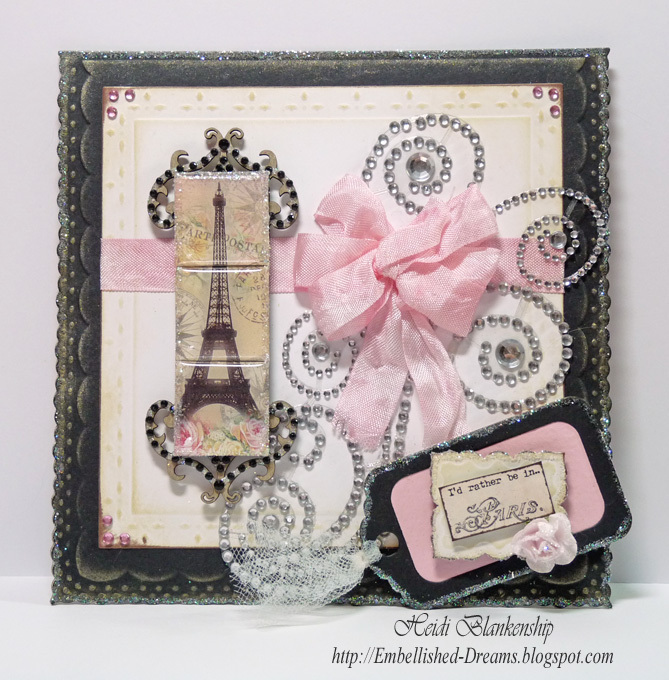 I also added some 3D Foam Squares from Scrapbook Adhesives to make the pieces pop even more. I added a variety of ribbons and tulle to the rings. 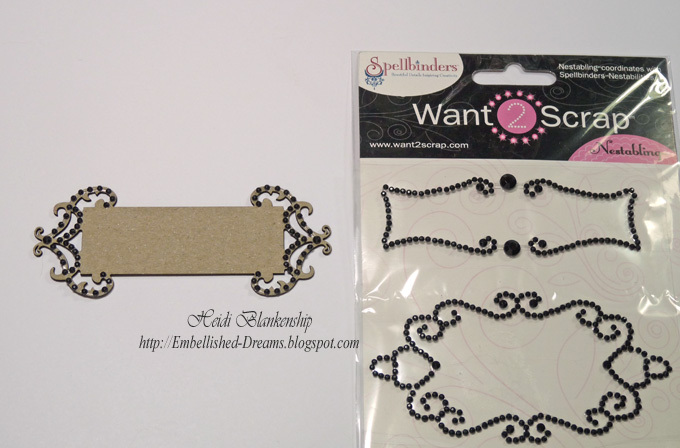 The ribbon is from Want2Scrap™ and can be found at the consumer shows. Once I have the inside of the album done I will do another post to show you more of the pictures. Thank you so much for stopping by today! Please be sure to check out the Want2Scrap™ Blog tomorrow as we will be announcing the winners of the CHA Sneak Peek Giveaway. Good morning! I am back home from CHA! Wow--What a week!! The show was amazing!! I always love being able to see friends old and new and all of the great new products. 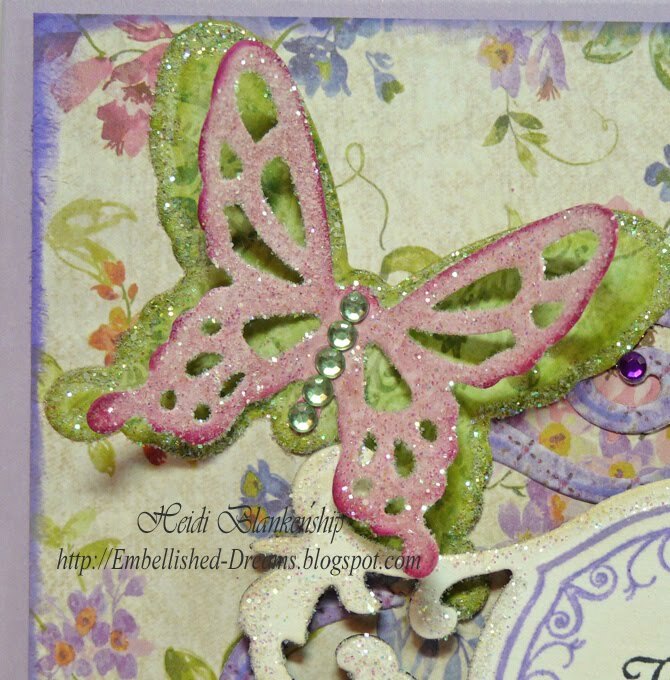 I spent most of my time demoing in the Spellbinders booth. 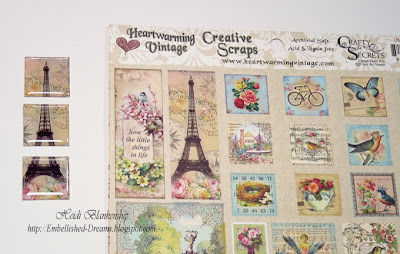 But I did get a chance to take some pictures of Spellbinders, JustRite Stampers and Want2Scrap booths. 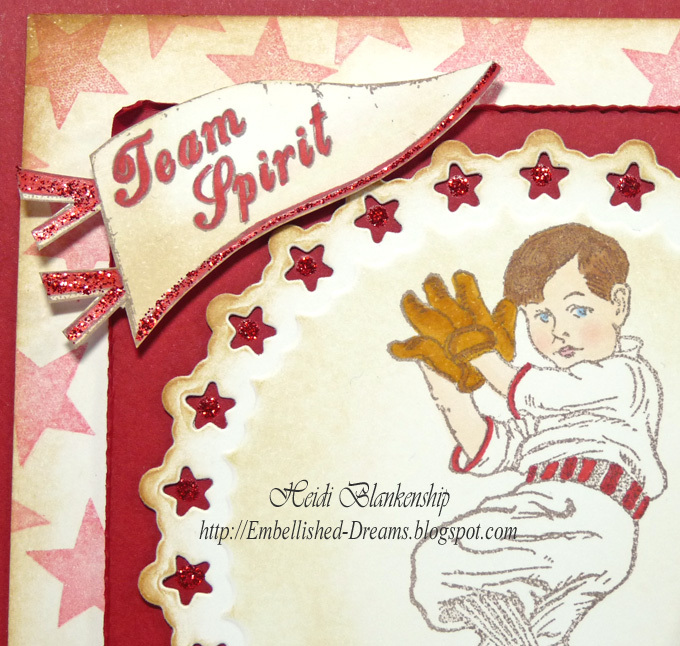 Pictures for the Spellbinders Booth. Sorry I can't share any close up pictures with you as a lot of the artwork was picked up for publication. I was very excited to find out two of my pieces in the Spellbinders booth were picked up for publication. 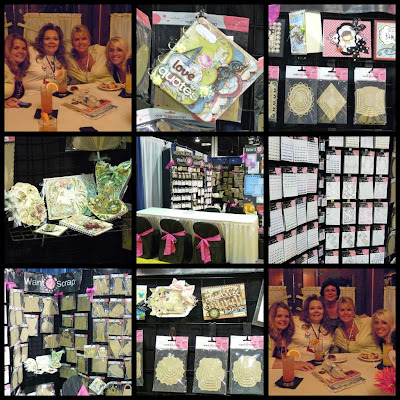 A few more pictures from the Spellbinders booth. 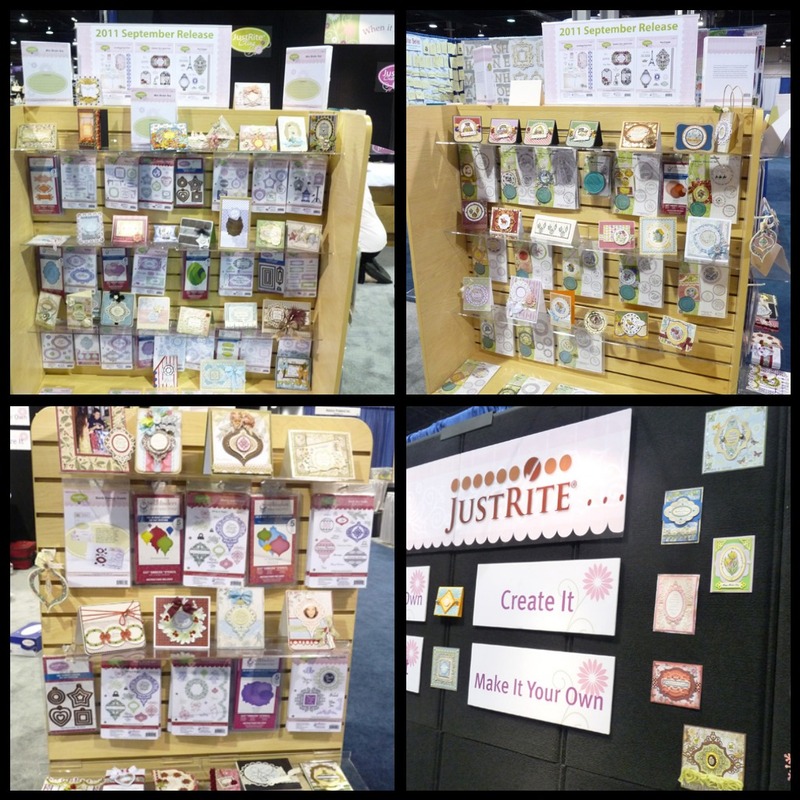 Pictures from JustRite Stampers booth. I have several more pictures but I was down at the booth early in the morning taking pictures and I forgot to ask if any of the artwork was picked up for publication so I didn't want to share too many photos until I know for sure. Here are a few pictures from the Want2Scrap™ booth. At the top you can see some of the New Swirls and Flowers. One of the Newest products we are very excited about is Nestaboard™! Want2Scrap™ now has the Nestabling™ and Nestaboard™ to match Donna Salazar's S5-048 Sprightly Sprockets. 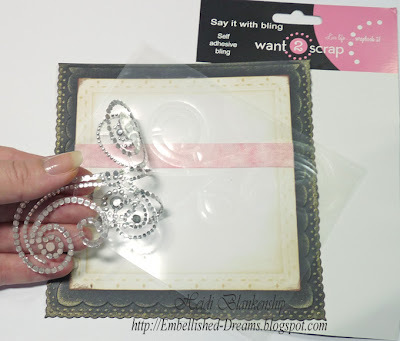 More pictures from the Want2Scrap™ both. Ok now for the card I am sharing with you today. 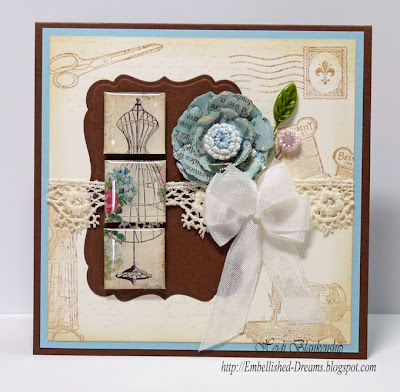 To create the background I used Artsy Banner and Material Girl stamp sets from Crafty Secrets with Vintage Photo and Antique Linen Distress Inks. 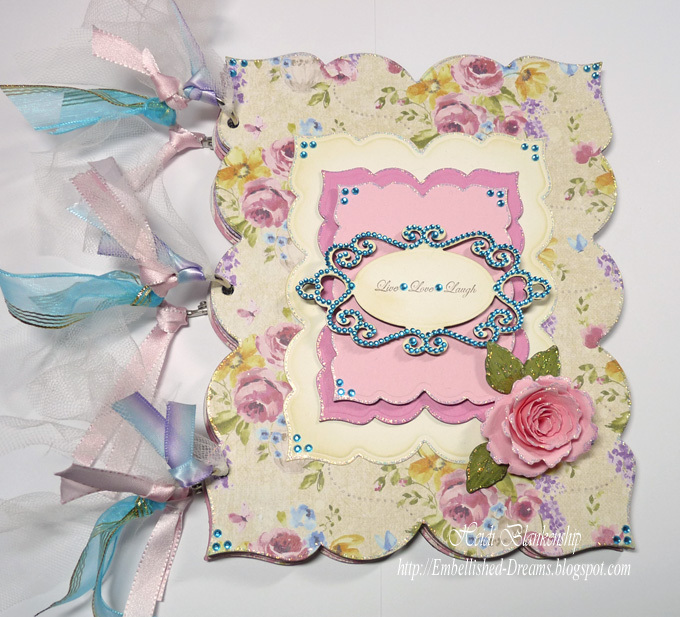 The dress form image is from Mini Vintage Creative Scraps from Crafty Secrets. I added the 1'' Square Clear Epoxy Stickers to the image and hand cut. 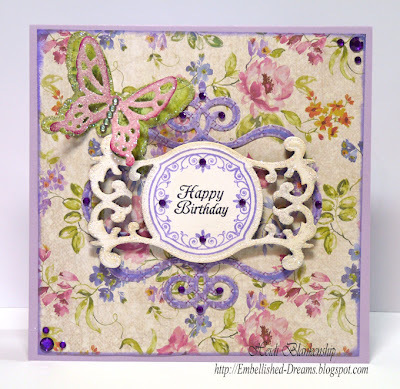 To create the label I used the Grand Calibur and S5-025 Labels Seventeen #4 from Spellbinders. To create the flower I used old book pages, die cut with S5-050 Rose Creations, inked with Blue Sky Ink and edged with Diamond Stickles. I used a crochet flower center made by my Aunt Gail. Then I added a bow made with seam binding and a couple of Maya Road Trinket Pins. 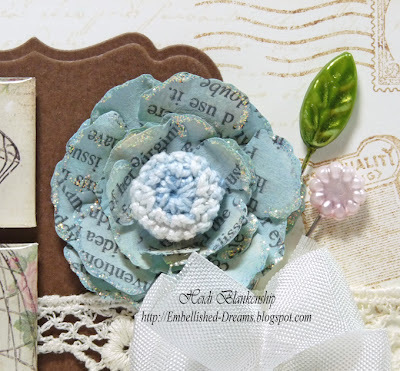 Accessories: Crafty Secrets Mini Vintage Creative Scraps, 1'' Square Clear Epoxy Stickers; May Road Trinket Pins; Seam Binding; Vintage Lace; Aunt Gail Crochet Flower Center; Ranger Diamond Stickles; Scrapbook Adhesives by 3L 3D Foam Squares. I want to say thank you so much for visiting my blog while I was at CHA. I had a few post scheduled for while I was gone but I didn't have a lot of computer time so I wasn't able to reply to all of you comments and emails. But I want to you know I read them all and thank you so much for you kind sweet words and wonderful comments--I appreciate it SO MUCH!!! Thank you so much for stopping by today and I hope you have a wonderful and creative day!! Good morning blogging friends! 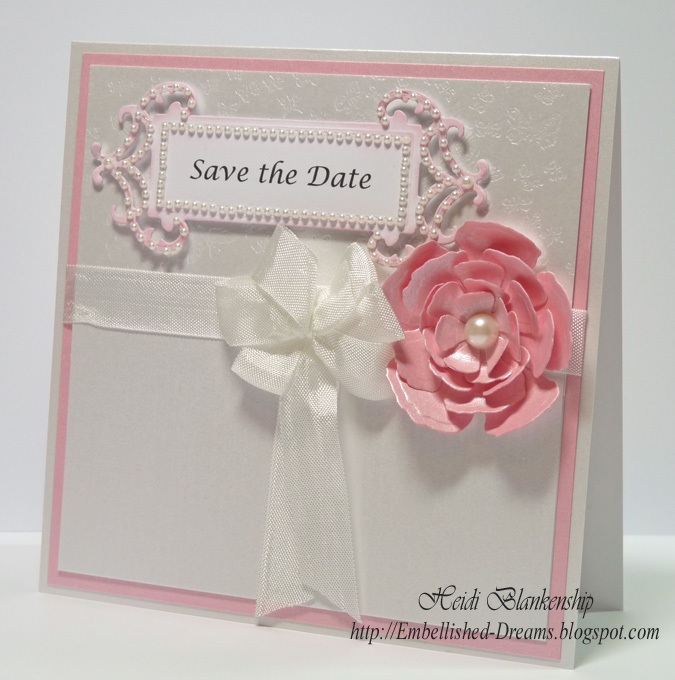 I have a quick post for you this morning with a wedding card using the Bazzill Wedding Multi-Pack from Discount Cardstock. I also used Mountain Rose Metallic and Simply Smooth White for the rose and tag. Sorry it's such a quick post for today but I have to finish getting ready this morning and get over to the show. 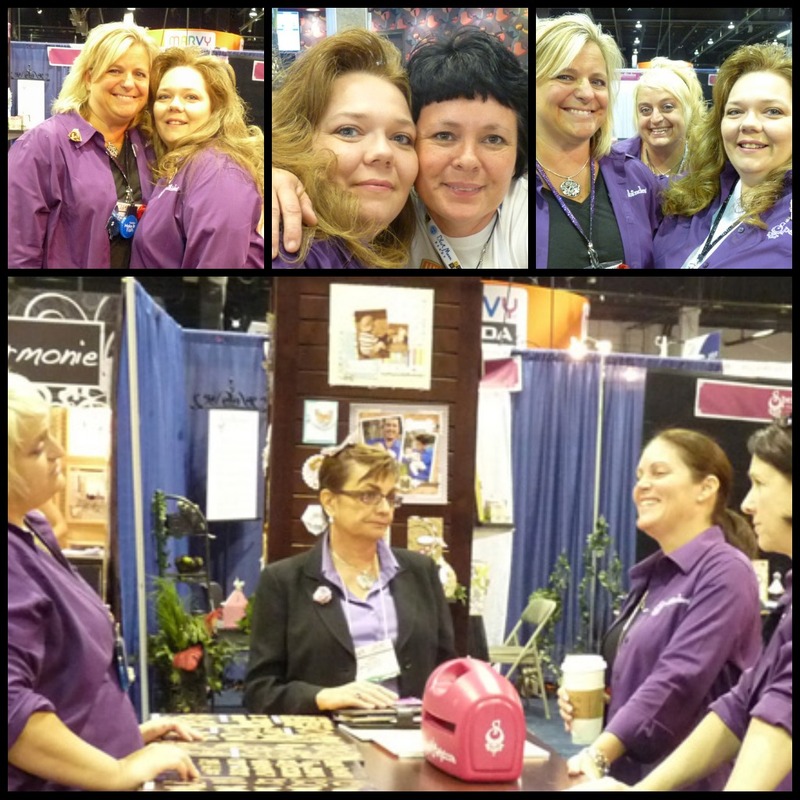 CHA has been Fantastic!! It's always so much fun seeing friends old and new and all of the new products too!! Thanks so much for stopping by today and I hope you have a GREAT Day!!! 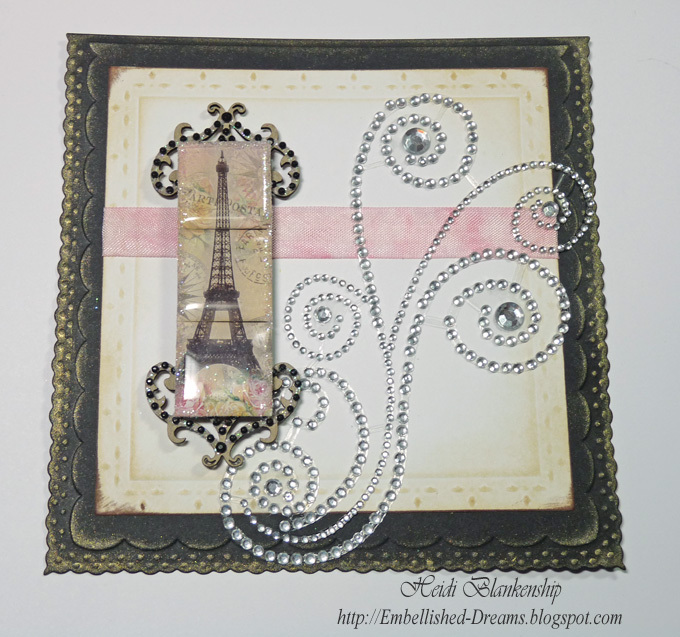 Blingy Swirls - I'd Rather be in Paris! Good morning! 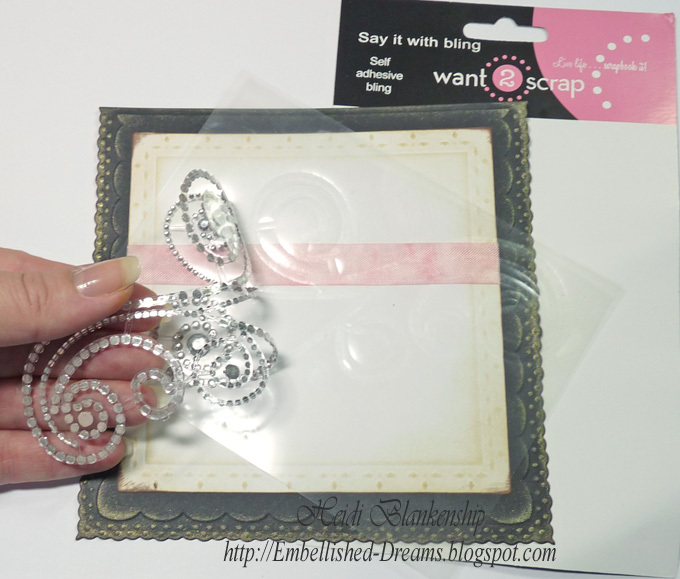 Today, I have a mini creative page to share with you using some of the NEW Want2Scrap™ products. 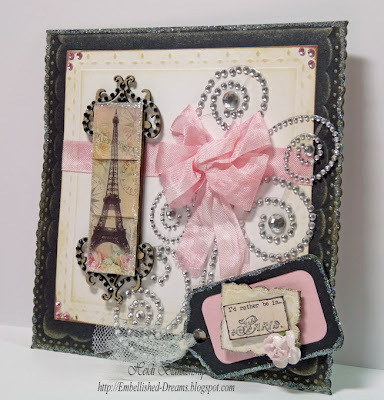 I created this fun--I'd rather be in Paris--creative page using Nestabling™ Fancy Tags Two Black Rhinestones, NEW Nestaboard™ Fancy Tags Two, NEW Nestaboard™ Labels Twenty-Three, Baby Bling Pink Rhinestones and NEW Swirls, Maxxi Girl Rhinestones Silver from Want2Scrap™. To start I created the tag using the NEW Nestaboard™ Fancy Tags Two. I left the Nestaboard™ raw and then added part of the matching Nestabling™ Fancy Tags Two Black Rhinestones. Next I added the image using Crafty Secrets Mini Vintage Creative Scraps and 1'' Clear Epoxy Stickers. 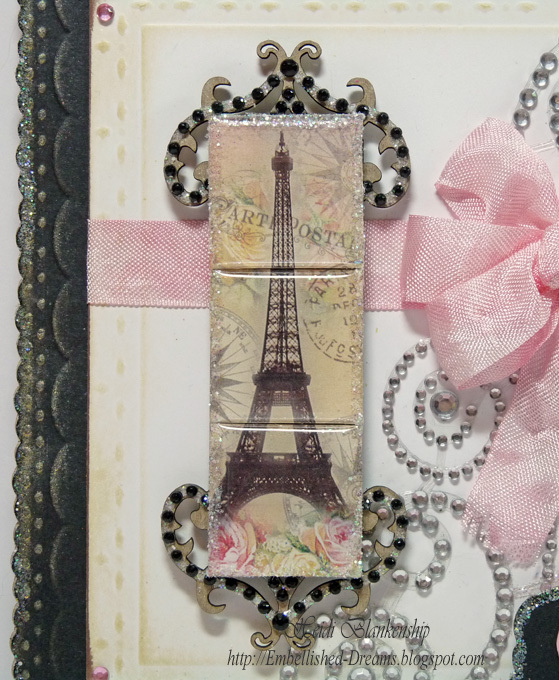 I added the image to the tag using 3D Foam Squares from Scrapbook Adhesives by 3L. Then I edged the image with diamond glitter. 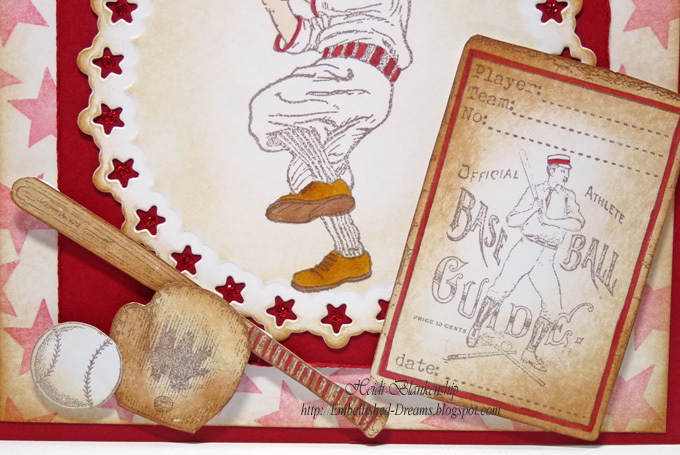 Next I used the Grand Calibur™ and LF-002 Creative Book Pages Two and S4-347 Labels Twenty-Three to create the die cuts. 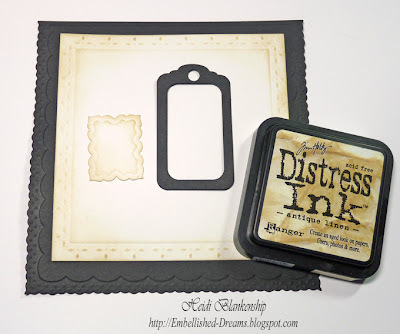 I used Soot and Simply Smooth White cardstock from Discount Cardstock and then I inked the edges with Antique Linen Distress Ink. 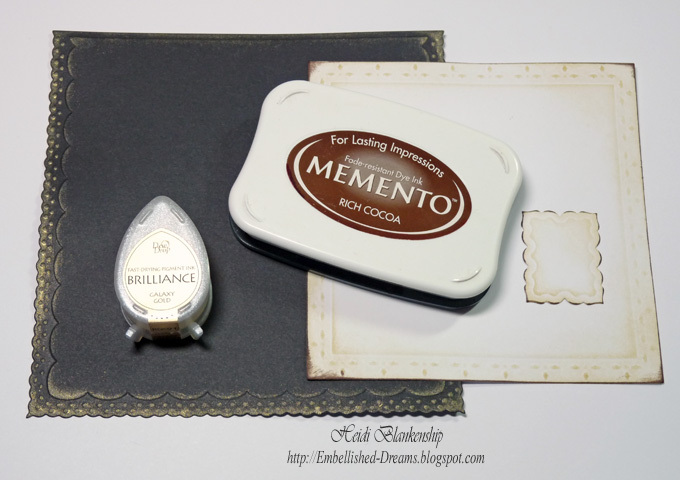 Then on the black I added Gold ink to the edges and on the white I added Rich Cocoa ink to the edges. 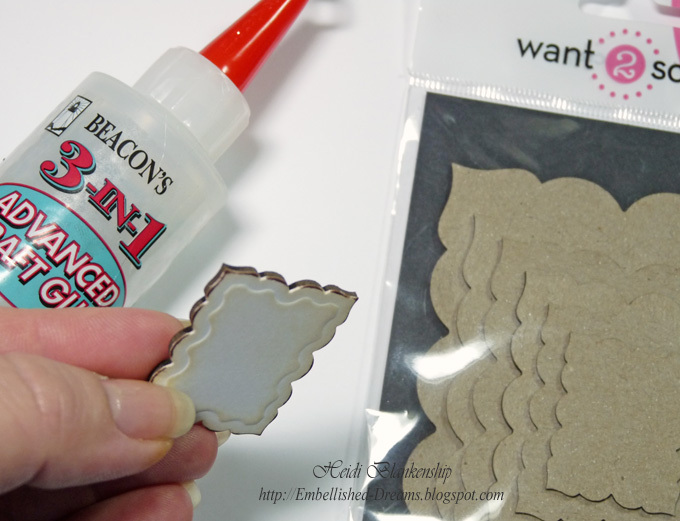 I used 3-in-1 Advanced Craft Glue from Beacon to adhere the die cut to the Nestaboard™. What a perfect match!! I started to assemble the creative page once I had all the pieces done. I added NEW Swirls, Maxxi Girl Rhinestones. I Love these large swirls! Look at all the gorgeous bling! 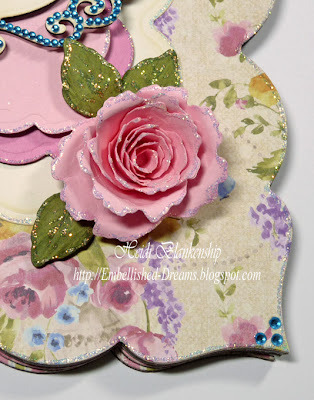 I love the larger rhinestones in the center of the swirls. Here is a close up of the tag. I love this sentiment! 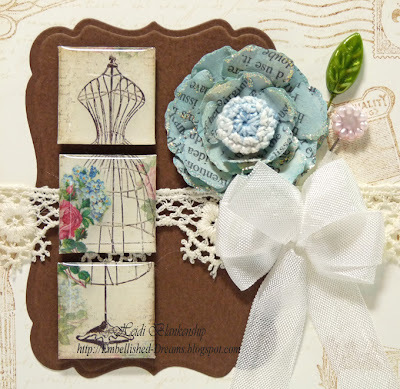 The sentiment is also from the Mini Vintage Creative Scraps from Crafty Secrets. 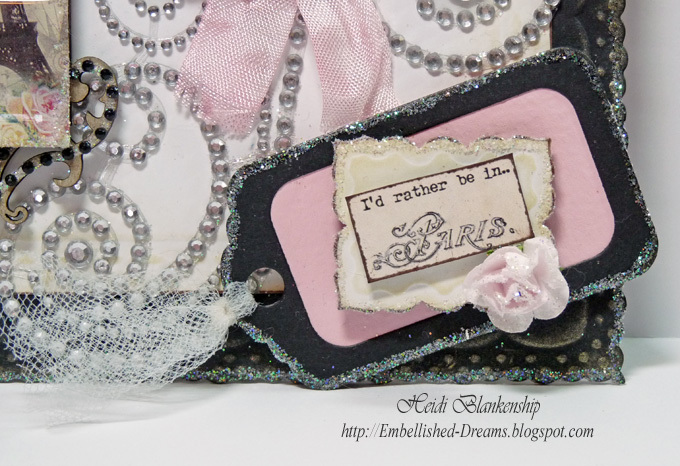 Nestabling™ Fancy Tags Two Black Rhinestones, Nestaboard™ Fancy Tags Two, Nestaboard™ Labels Twenty-Three, Baby Bling Pink Rhinestones, Swirls, Maxxi Girl Rhinestones Silver . Well I am not in Paris but I am pretty excited about being at CHA!! *wink* I am here at CHA with Spellbinders and yesterday we worked on setting the booth up and then when out for our company dinner. 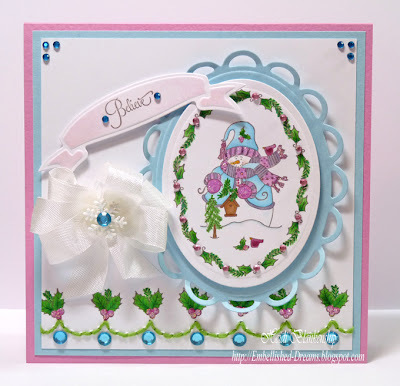 We are having a great time and please be sure to check out Spellbinders website a little later this morning (after 10 am) to check out ALL of the New Releases!!! 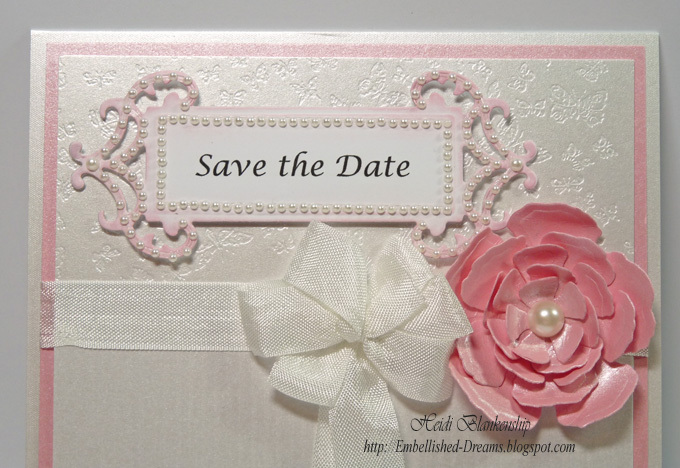 You are going to LOVE them!! Thanks so much for stopping by today! 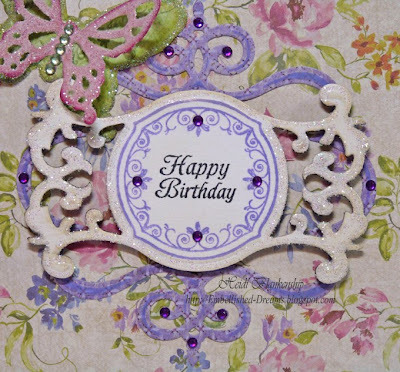 I hope you have a Fantastic and Creative Day!! Good morning!! It's time for another Crafty Secrets Design Team Challenge! 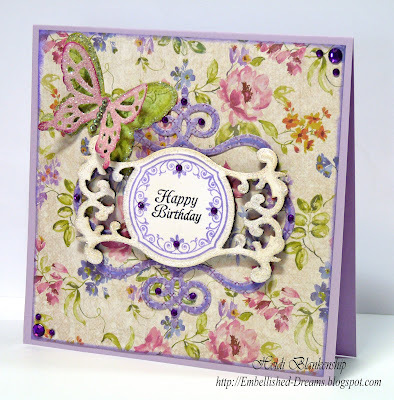 This month our challenge is to design a project with some of the fantastic New products from Crafty Secrets. 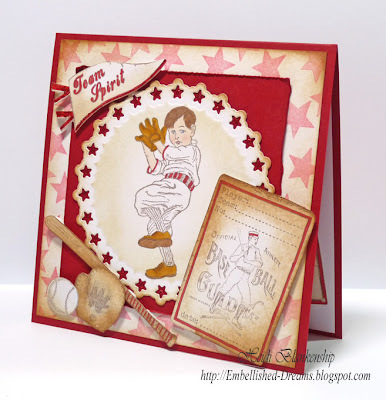 I used the New Play Ball stamp set from Crafty Secrets to design this fun Baseball card. This would be perfect for a little boy's birthday. To start I stamped the image using Rich Cocoa Ink and stamped on to Simply Smooth White cardstock. The I added color to the image using Copic markers. Next I stamped several of the images, added a little color with a red Copic marker and then hand cut the images. Then I used the Grand Calibur and S4-335 Star Circles #4 to cut/emboss the die cut shape. 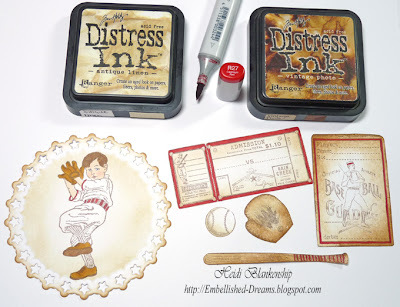 Then I inked the edges of all the piece with Antique Linen and Vintage Photo Inks. To create the background I stamped the star image with Lady Bug ink and then inked the outer edges with Antique Linen and Vintage Photo Distress Inks. 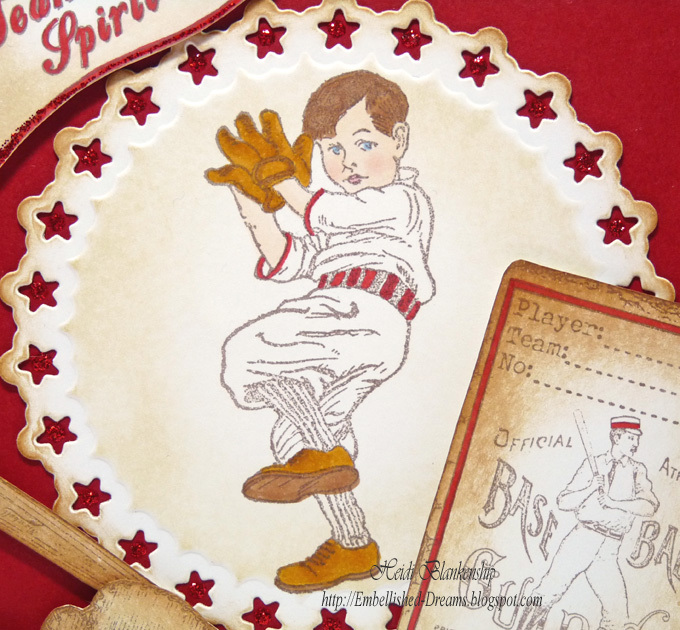 Here is a close up of the image of the little boy playing ball. 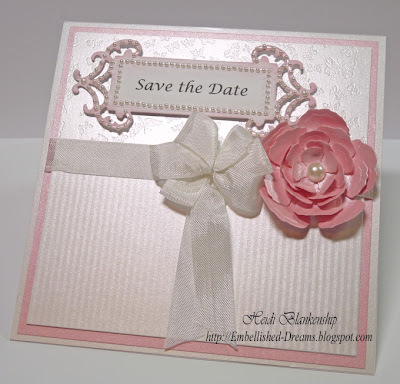 I added some of the images to the bottom half of the card. 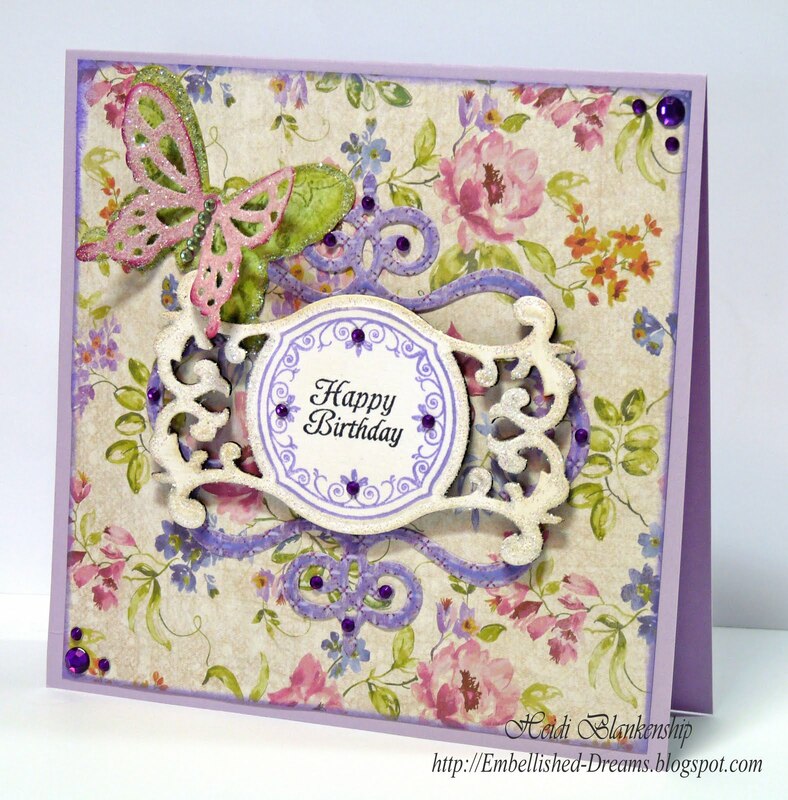 Please be sure to visit the Crafty Secrets Design Team Members to see what they have been busy creating to share with you. Bling On The Boardwalk & Happy 4th of July! !